How does the human mind develop? The FOUNDCOG project aims to address this question by using neuroimaging of infants, in their critical first year after birth, to capture the development of the brain and its functions. We will interpret the results by comparing them to computational models of learning from artificial intelligence. In addition to characterising the development of the human mind, we aim to understand how it is disrupted by brain injury and to produce new diagnostic tools for neonatologists. In this post, you will work in an exciting environment alongside a highly qualified and imaginative team, to acquire and analyse neuroimaging data from infants, and compare the results to computational models of learning from artificial intelligence. The lab has substantial expertise in infant neuroimaging, MRI methods, developmental cognitive neuroscience, programming, cloud computing and computational modelling and there will be many opportunities to develop these skills. 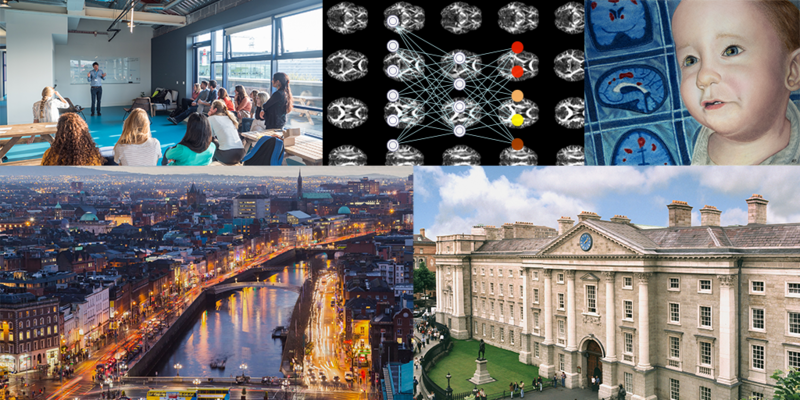 There are also postgraduate courses available to all Trinity PhD students, in topics such as statistics or creativity. There are bi-weekly lab meetings that offer the opportunity to develop skills such as critical thinking and presentation skills, and an imaging interest group to develop knowledge of MRI. Members of the lab frequently attend training courses, to develop specialized knowledge such as brain anatomy. You will attend national and international conferences, to present your work and to develop a network of people in your area. The studentship will be supervised by Professor Rhodri Cusack (TCIN). The lab is committed to equality and diversity. Our group is located within the prestigious interdisciplinary Trinity College Institute of Neuroscience (TCIN). TCIN is located at Trinity College in the heart of Dublin. Trinity was founded in 1592 and is ranked as Ireland’s No.1 University in the QS World University Ranking, THE World University Ranking and the Academic Ranking of World Universities. It is a member of the League of European Research Universities. Stage 1 deadline Jan 14, 2019. Subsequent stages, for the successful candidate are described on the China Scholarship Council (CSC) – Trinity College Dublin Joint Scholarship Programme page.